Dangerous false teachers that deceive people into relying on their flesh’s self-righteous efforts to bring them into God’s favor are prevalent worldwide, including the “evangelical church.” If you are in ministry and not engaged in the battle for sound doctrine that holds firm to the gospel of grace, then you are building a ministry that will not outlive you. A minister of the gospel must also be a courageous defender of it in the presence of wolves, for the sake of the sheep whose blood they crave and whose souls you’ve been given watchcare over. 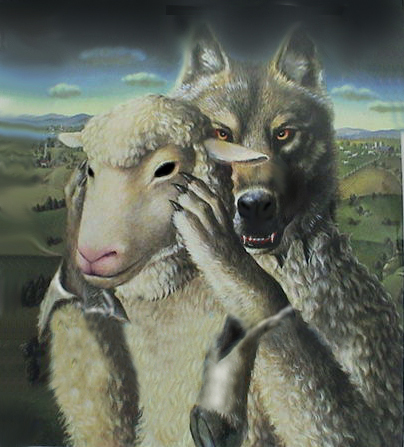 Keep in mind that those wolves always look like sheep on the outside, to every man’s eyes, including your own. And be very clear in your teaching, ceaselessly reminding the sheep that their eternal salvation is both obtained and maintained by God’s grace alone, received by faith alone in Christ alone. Nothing more. Nothing less. Nothing else. This entry was posted in Commentaries on life and faith, Devotionals, The Gospel and tagged defending the faith, sound doctrine, wolves in sheep's clothing. Bookmark the permalink. just to say it’s really good to be connected with you people!